ShortScale :: View topic - HNB's Vandalism Project Finished Pg. 2! HNB's Vandalism Project Finished Pg. 2! Posted: Fri Oct 03, 2014 11:44 pm Post subject: HNB's Vandalism Project Finished Pg. 2! 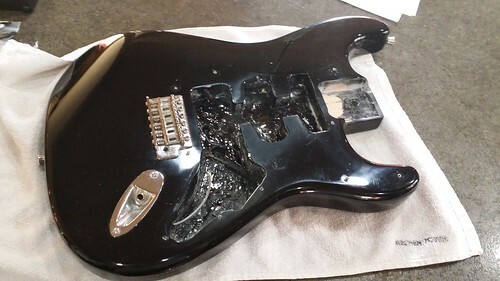 I am sure I will take some flaming for it, but I had this body left over because I just wanted the maple neck for my Univox project. The body was actually pretty nice so I wanted to do something with it. I was thinking about what I could do and kept going to this. Yeah I know "LOL teh kurdtz" etc. 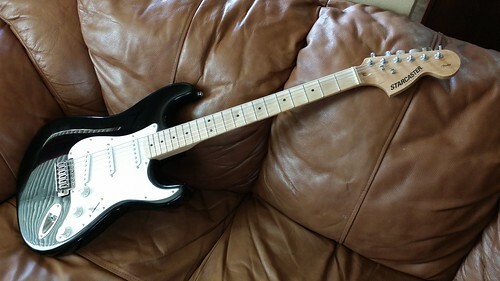 I think it is a cool looking strat and I had all the parts aside from sticker, pickguard and neck. 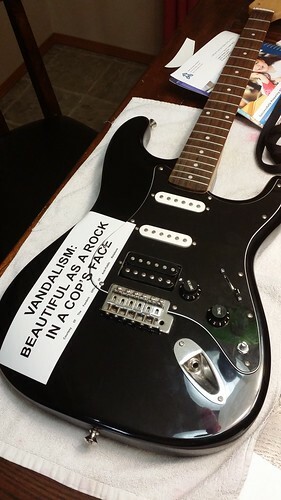 I ordered a SSH guard, repro sticker, and neck. 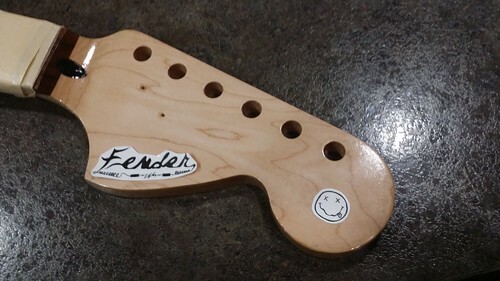 The neck came today. Nothing fancy, but it seems to be in good shape and wasn't expensive. These are great project necks because the decal is barely on there. Took maybe two minutes with the palm sander to get it cleared off. My plan for the decal is kind of tribute-ish. I think it should be kind of fun. I have a Gibson ceramic humbucker for the black bridge pickup. 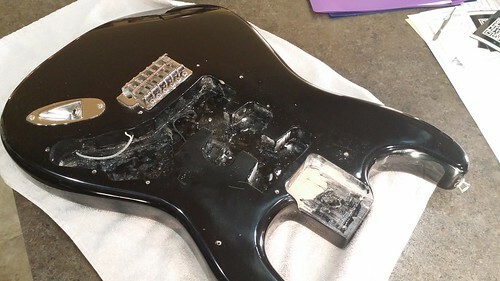 I will keep the stock neck and middle pickup it had already. I had a volume and tone strat knob in my parts bin. 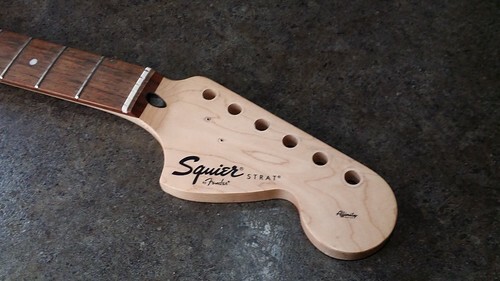 I also had a Fender bridge from Andrewdoeshair that I popped on it in place of the Squire bridge it had. I also had some nicer tremolo springs from Andrew I popped in there. I have strap locks for it already also since I like those. It should look pretty cool when done. For the sticker on the body, I am going to use tape to place it and lay the guard over it so I can trace where the guard overlaps the sticker. 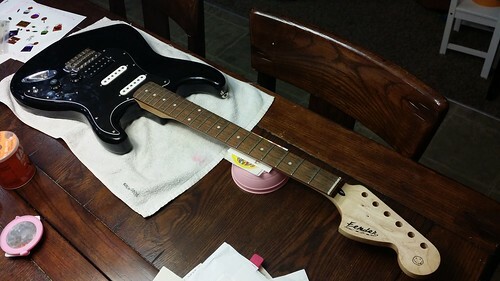 Then I can cut that shape out carefully and stick that part to the pickguard and the other part to the body. 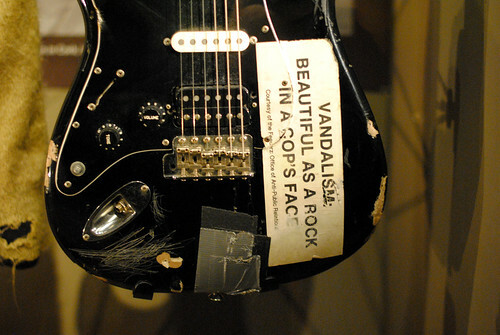 but I would leave the sticker and relic job out of it. Oh I am not going to relic it. Just the Vandalism sticker. If I end up not digging it, I can just take it off no biggie. I am changing the pots (since the stock ones were wussy mini ones) and upping them to 500k. 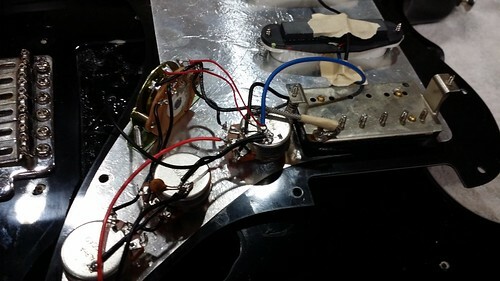 Also putting in a more sturdy selector switch vs the stock squire computer chip style one. Or "Error 404 Not Found"
I do like this, but it would be much better if it said "Fedner"
Got some things so I did some work today. 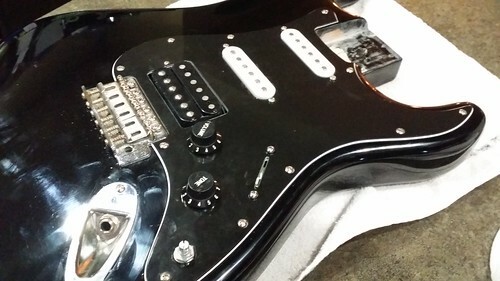 Pickguard came and matched up just fine. I got the larger 500k pots on and sadly found out that the body routs did not have enough room for them. I decided to use my dremel to grind a bit in the spots that needed widening and it worked out just fine. 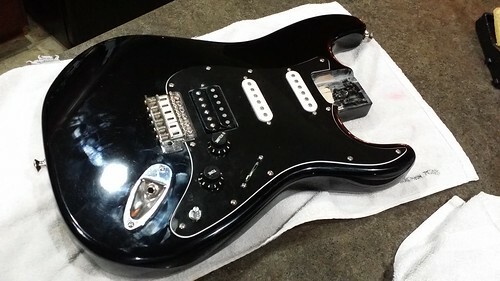 I also had to drill two spots in a bit where the humbucker is because of the mounting screws hitting the inside of the body. I hit it with some black paint to make it look a bit cleaner and I am happy with it. 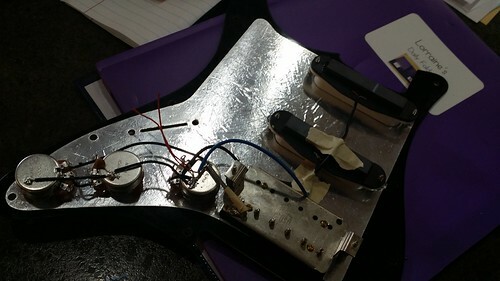 I also did a bit of the wiring and also put the strap locks on. Once the selector switch comes in, I can finish the guts up. 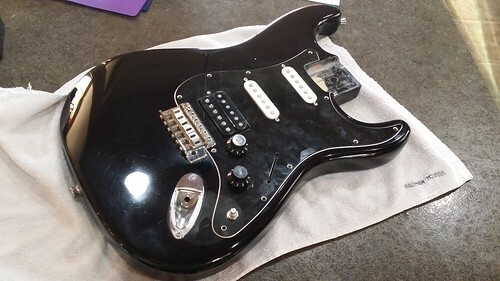 Anyone know a way that doesn't involve having strings on to make sure my humbucker isn't out of phase to the rest of the pickups? It probably won't matter because I won't likely use the neck and middle, but it would be nice for my ocd for them to work right together. Decals printed misted and applied. Once they are dry, I will begin light clear coats over them. Nice job sir. Funnily enough, despite his association with Jags/stangs... he probably played Strats just as much. 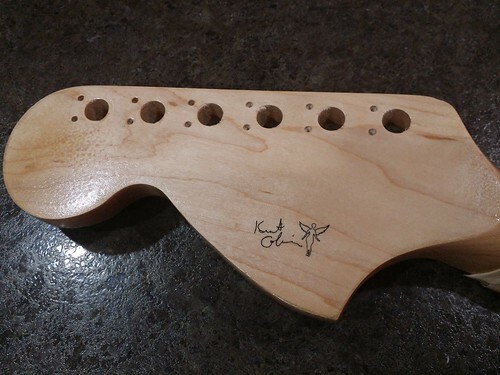 Would be cool to go all out with the same shape headstock / no truss rod hole... but guess that is super nerdy. 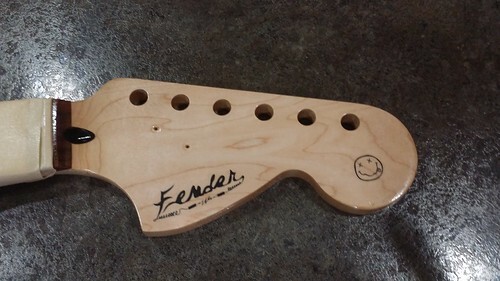 Nice nod to a iconic guitar, and you've put your own touch on it. Decal is cool. So I tell my students in art that details are the little things you add to your work that make it more special and cool. I put this little decal together for the back and I am very happy with it. Subtle, but pretty awesome. Yeah nice touch there HNB, are you going for the Vandalism sticker ? You can buy re-pros online I think, or at least a scan is available. Judging buy your decals I guess you can produce your own. Picked up a repro on ebay cheap. Switch came and I finished up the wiring. 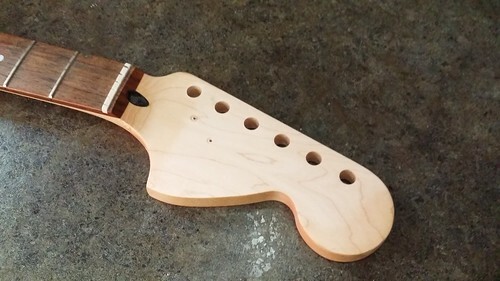 Just need the sticker and the neck to be done and it is good to go! Clear is done and drying. Had to see how it will look. Psyched! Decal came in! I put it in place under the guard and traced the guard line in pencil on the decal. Then I cut that piece off. I placed the big piece on the body and then I put the little one on the guard. Looks good. Only sucky thing is I got a lot of air bubbles. I popped them but now there are little dots all over the place. Hard to see unless you are right over it. LOL This type of decal wouldn't pull up well or I would have peeled it up a bit and put it down again. I dig it. Spare parts projects usually yield surprisingly cool results. I so want dibs on that when you wanna sell it ..